With the end of the Aztec Empire and the Spanish destruction of Tenochtitlan (the Aztec’s capital) in 1521, many history textbooks teach us that the conquest of what is now Mexico ended. This was far from the case. As the Spanish went further north and south, they encountered more resistance to their rule. In the south, the Spanish would encounter the Mayans who resisted the Spanish for over 300 years. The Mayan resistance would in fact continue into the 19th Century after Mexico gained its independence. In the north, the Spanish encountered fierce resistance among certain peoples related to the Aztecs by language and to an extant custom. Among those who resisted the Spanish were the Acaxee, the Tepehuan, and the Chichimecas. The Spanish over-estimated their own strength and prowess, and under-estimated the native Mexican peoples they would fight. The Spanish fought the Acaxee in the Acaxee Rebellion (1601-1603), the Tepehuan in the Tepehuan Revolt (1616-1620), and the Chichimecas in the Chichimeca War (1550-1590). Of these three, the Chichimeca War was the bloodiest for both sides. The Spanish first encountered the Chichimecas in the 1540’s. The Chichimecas were a nomadic to semi-nomadic people who were loosely organized. The Spanish tried to enslave them and take over their territory which was rich in silver mines. The Chichimecas resented this, and this led to war. The Spanish could easily defeat the Chichimecas in open battle, but the Chichimecas were adept at guerrilla warfare. The Chichimecas would attack Spanish armies and settlements when the Spanish least expected and slaughter whole towns. This actually left the Spanish on the defensive, and they had to drive deep into Chichimeca territory to try and pacify them. This did not work. The Spanish at first tried using its Indian allies to fight the Chichimecas for them. 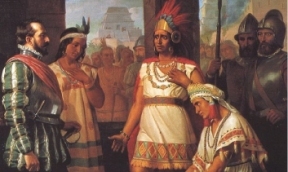 The Spanish Indian allies had no luck against the Chichimecas. Then the Spanish tried the policy of “fire and blood;” a policy of slaughtering as many Chichimecas as possible and destroying their homes. This also did not work. If anything, it resolved to make the Chichimecas attack the Spanish more. Then the Dominicans, one of the Catholic orders of the Roman Catholic Church in New Spain (Mexico), resolved to try and defeat the Chichimecas by “rewarding” them with land, supplies and weapons for self-defense. This actually worked, and gradually the Spanish were able to win over those Chichimecas who allied with them and defeat those Chichimecas who continued to fight against them. This Spanish strategy worked, but it came at a price for the Spanish who lost over 200 of their own and 2,000 Indian allies. The Chichimeca War showed that the Spanish were vulnerable, and in the next 200 years, Spanish rule would again be challenged.